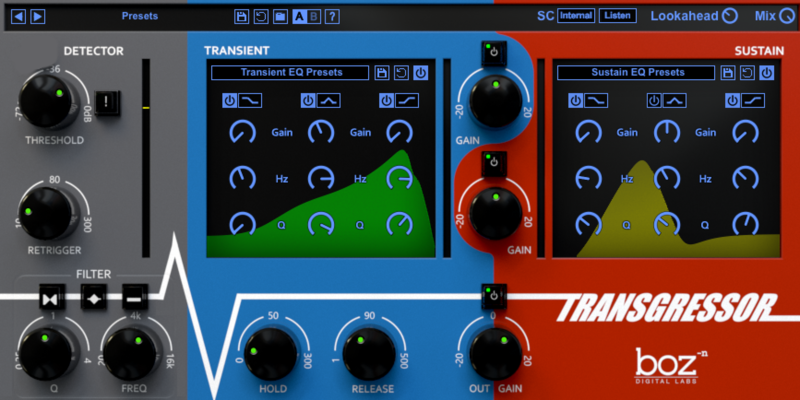 Boz Digital Labs' Transgressor is a hybrid EQ and transient shaper. 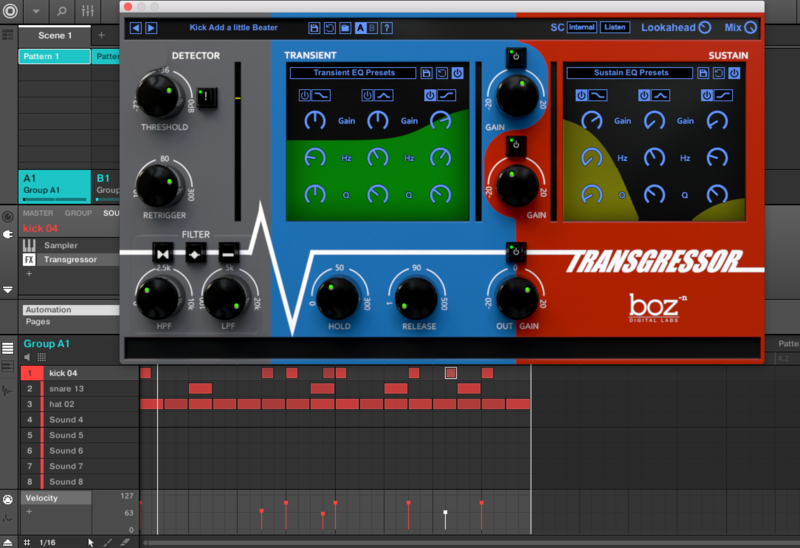 Giving you separate EQ control over your transients and your sustained sounds, Boz Digital Labs promises that Transgressor is the new standard of transient design. Whether you need to subtly enhance your sound or completely overhaul your sound, Transgressor makes it quick and simple to do so. Transgressor is comprised of 2 EQs. One for your attack and one for your sustain, letting you shape exactly the way you want your attack to sound. 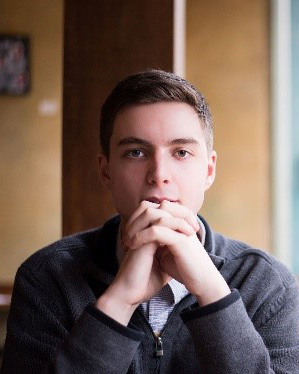 Transgressor specializes in shaping hard hitting drums, tight drums, or big sustained drums. The plug-in lets you dial in the parameters exactly the way you want it putting Transgressor in a league of its own. Boz Digital Labs crafted Transgressor to be as light as possible on your CPU, giving you the ability to put this on many tracks without eating up your processing power. The 'Transient' section lets you control the percussive parts of your sound. For example, the attack of your kick drum, the slap of your bass, strum of your guitar, or anything with a percussive element to it. Within the GUI the user can enable or disable the transient which becomes very helpful when dialing in your sustain tones. 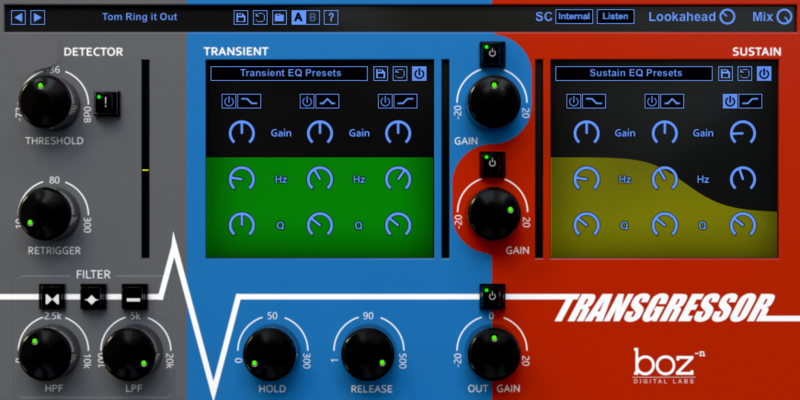 The 'Transient' section is built up of parameters such as: transient gain, hold, release, EQ and Transient EQ presets. Beyond giving you the ability to save presets for the entire plug-in, you can save and recall presets for the transient EQ, without affecting any of your other settings. The Transient EQ is a 3-band equalizer that equalizes only the transient portion of your audio signal. The EQ curve is shown behind the controls. Band 1 and 3 are made up of 3 filter type options: high pass filter, low shelf filter and bell. Band 2 is made up of 3 controls: Bell, Band pass and slant. Each band gives you separate control over the gain, frequency and bandwidth of each filter. The 'Sustain' section lets the user dial in the tone and level of your sustained sounds. This gives you direct control over the sound of your tails and resonances. Here, the user can bring out or reduce the ring or boom of their sound. The sustain section houses the same controls and EQ as the aforementioned transient section. The final area of the GUI is the 'Transient Detector.' The 'transient detector' is made up of the following controls: threshold, retrigger, hard/soft switch and low pass/ high pass filter control. These controls adjust how the transient detector will respond to and trigger transients. The user can use these controls to prevent bleeding from falsely triggering transients. The 'threshold' knob controls how sensitive the detector is to transients. When set low, the original audio will need to contain extremely strong transients. When set high, the detector will be very sensitive to transients. The 'retrigger' knob controls how much time must pass between triggered events. When set low, the detector will detect all transients. When set high, the detector may not detect super-fast passages. The 'hard/soft' switch lets you decide if transients under the threshold will be triggered or not. Finally, the filter section is a simple sidechain filter that lets you dial in which frequencies will trigger the transient detector. 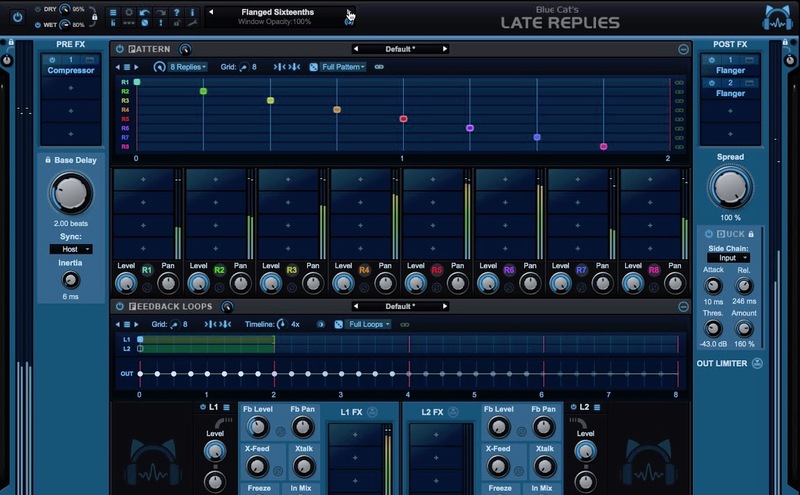 In addition to giving you full control over the sound of your transients. Transgressor adds another layer of creativity by adding sidechaining. 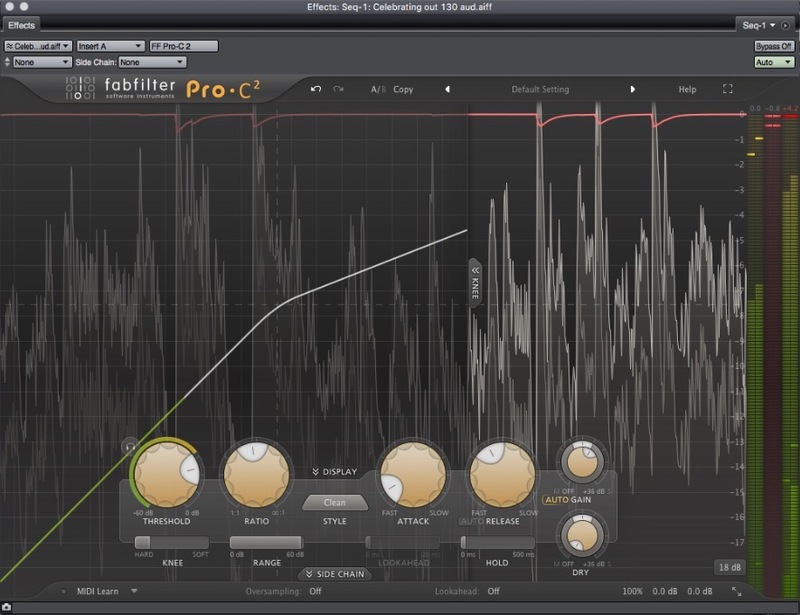 This lets you set the sidechain to either internal or external detector. When set to 'internal,' your transient detector will trigger based on the incoming sound. You can set it to external sidechain when you want a different sound to trigger your transient. To give the user more control of their sidechain, Transgressor has a 'sidechain listen' function. This lets you monitor your sidechain signal, to help you dial in the settings. The sidechain EQ will be applied to the output when this is enabled. Transgressor comes equipped with its own preset menu focused to drum sounds. Although, not an extensive number of presets are available, each preset is of quality and provides the user with a great starting point to create and capture the sound they want. Presets are sharable across formats, computers and operating systems. The 'A/B' bank lets you quickly compare different settings and presets in the plug-in without losing your knob settings. Transgressor also has a mix control knob, allowing the user to blend between their wet and dry signals. 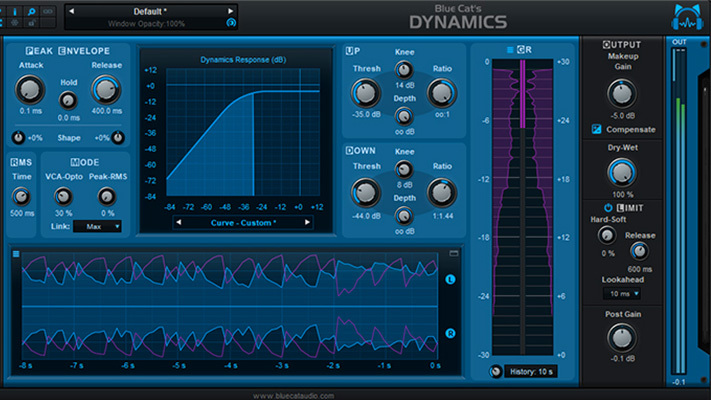 Independent EQ control for your transients and sustains. Increase or soften the impact of your drums. A/B bank to quickly compare different settings. I can’t say that I have many qualms with Transgressor. The plug-in is great! It does everything it says it’s going to do. The only thing I would like to see is more presets. The factory presets are limited and catered to only kick, snare and tom sounds. I would love to see some factory presets for hi-hats, basses, leads, etc. 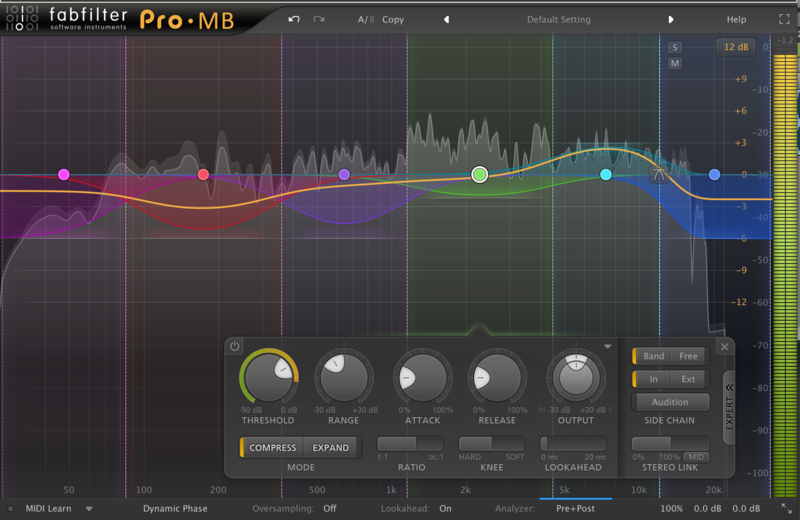 With more presets, I believe it would allow users to better understand the full potential of the plug-in quicker. Transgressor can bring dull muddy sounding drums to life; perfect for fixing up live recorded drums. 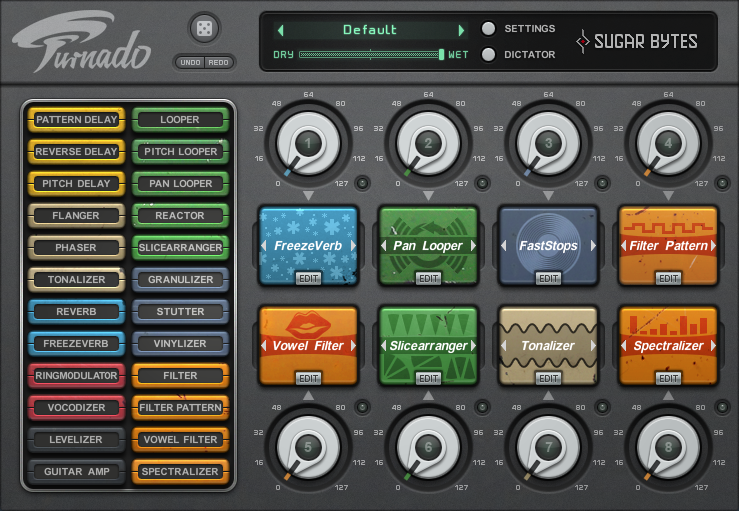 Making your drums punchier, Transgressor can clean up tracks and get rid of excessive bleed. Transgressor doesn’t stop at drums; it is also great for making melody lines sit better in a mix. Removing resonances without losing attack and cleaning up the signal on the sustain makes transgressor a unique plug-in. I have never used a plug-in of this kind. A couple of my other favorite things about transgressor is the reference hover and the bypass controls. Transgressor provides a short description of each control when you hover your mouse over any knob or button; useful when using the plug-in for the first time. Being able to bypass each set of parameters and solo various areas of the GUI allows for detailed editing. 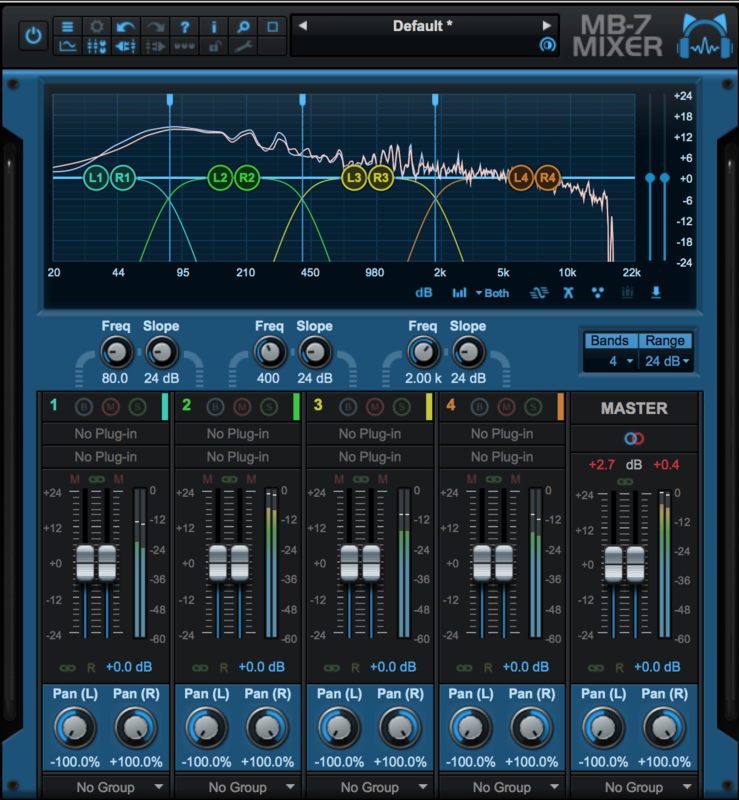 I found by using the bypass controls I could better understand how each function of the plug-in manipulating the sound. Very useful, for someone like me who does not have a lot of experience with using transient plug-ins. 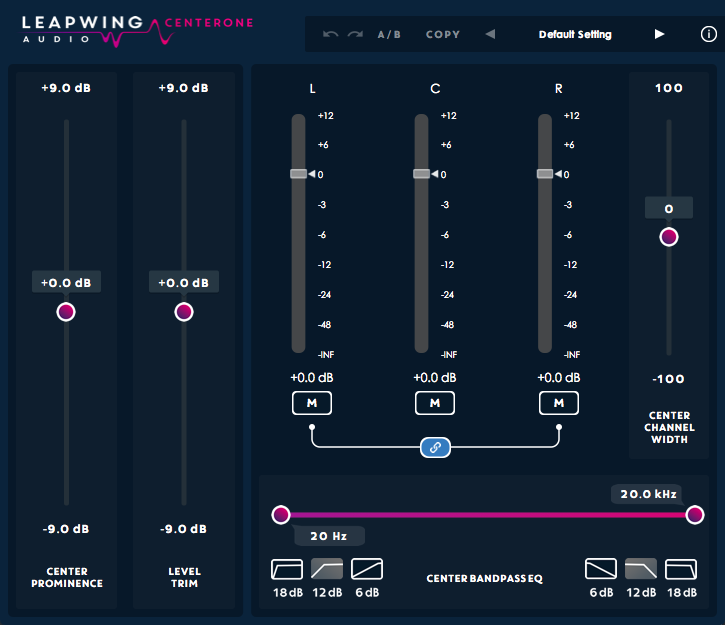 On top of producing quality sonic results, the GUI looks great and is very intuitive. My favorite thing about the GUI is being able to see the shape of the wave behind both the ‘transient’ and ‘sustain’ sections. On top of having an intuitive and ascetically pleasing GUI, the impact of Transgressor on your CPU is low. I can open several instances of the plug-in simultaneously. Making it much easier to use throughout your whole project. Overall I am very impressed and pleased with transgressor. I highly recommend it to any producer, specifically producers that work with live drum sound regularly. You will not be disappointed by this plug-in.